Recently, a good friend of mine asked if I would create a pendant for her niece. 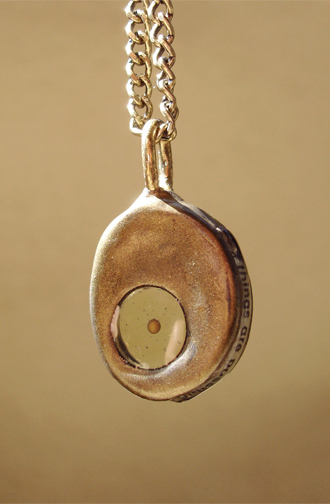 The only thing she requested was that it contain a single mustard seed, and the text, “all things are possible.’ I wasn’t familiar with mustard seed pendants at all. She suggested I do a search online to see what is out there, but that she didn’t like any of them. She wanted me to create something unique and different. I created this round version first. Originally I wanted to engrave the text, but found this extremely difficult on such a small piece. Reluctantly I had to cave and use printed text. 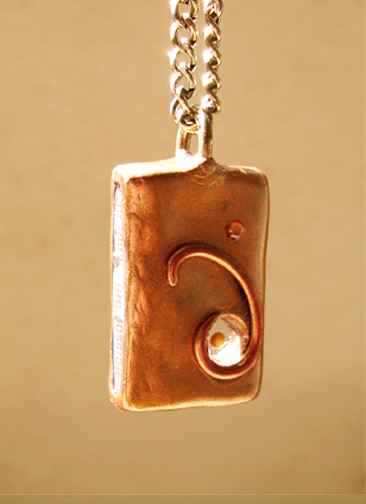 The pendant was sculpted out of polymer clay and finished with a metallic powder. I dug out a channel on the side of the piece, inlaid the text then filled the channel with clear resin. 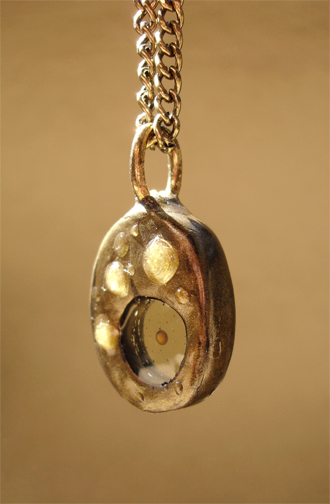 The droplets on the front of the pendant are a combo of plain clear resin and some with resin mixed with a bit of metallic powder. I made the bail by using a link from a thick chain I had and wrapping it with some thinner wire to anchor it to the piece. 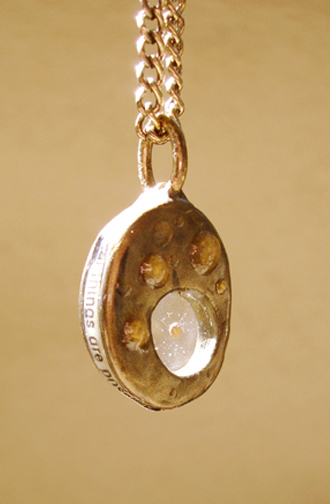 The mustard seed is encased in clear resin inside a round hole that was cut through the entire piece. After I finished sculpting the round pendant, I wasn’t quite sure I really felt confident in it. Another design popped into my head, so I created another pendant and decided I’d let my friend choose which she would like to give to her niece. This time I sculpted a rectangular shape with a metallic finish. Again I dug out a channel on the side of the piece, inlaid the text and encased it in clear resin. 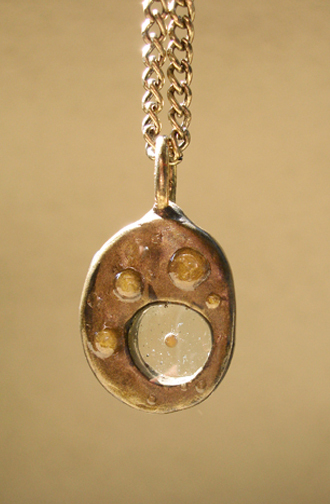 The mustard seed is also suspended in clear resin inside a round hole that runs through the piece. I embellished with a sculpted swirl and a single resin dot as an accent. The bail was created by taking a link from a chunky chain and secured with wire hidden inside the polymer clay. Here are a couple of other angles, showing the side with the inlaid text and the back of the piece. When it came time to show my friend the results, surprisingly she loved both and asked if she could take them all! 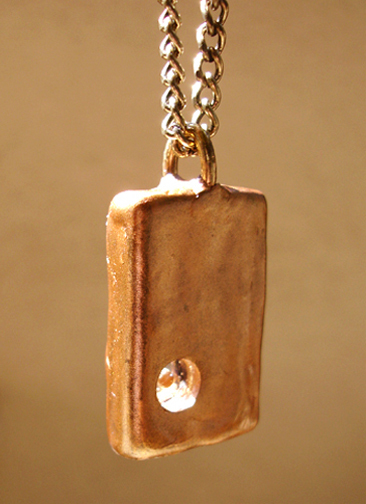 She gave the round pendant to her niece and kept the rectangular pendant for herself. I felt very flattered by how excited she was with both of them (and a bit relieved.) She has even commissioned me for a couple more of them! Pretty cool! Wow! So very nice and so personal! Thinking of the possibilites. In other words, I think I’m going to want something! Ooo! Just let me know if you ever have something in mind that you would like! Wow, those are VERY cool Pammy! I dig the floating seed idea. Thanks, Frankie! 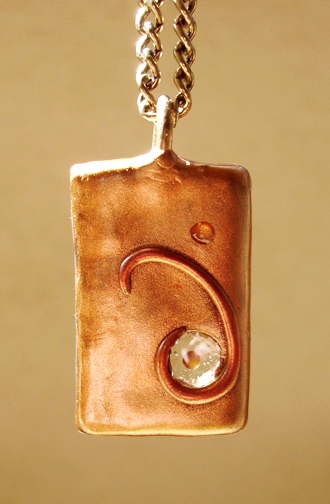 I am nearly finished with Cristina’s pendant. I plan on sending the whole set out to her next week! Oh! Wow! If you hadn’t already sold these pieces, they would have been my request. Love the floating seed idea. I am telling you… sell and they will buy (meaning me, of course). If you make new ones, let me know. I will buy one! Hi Cristina-these were actually a commission. I’m glad you really like them! Hi Suzanne! Really glad you like the pendants! I haven’t yet begun to sell my designs, but hopefully will get something set up in the near future!